In this three-part Spectrum special for Black History Month, Benjamin Baker highlights African American Seventh-day Adventist women who significantly contributed to society despite facing the triple strike of color, gender, and religion in an often antagonistic world. Read Part 2, on Irene Morgan here, and Part 3, on Ruth Temple here. Thomas Francis Marshall lived a productive 63 years. His father Louis was a physician and educator (president of Washington and Lee University, among other things) and his uncle John was the fourth chief justice of the United States. Thomas studied law with another of his uncles, James, who was a captain in the Continental Army and was nominated a U.S. federal judge by President John Adams. Throughout his life, Thomas had a thriving law practice, served as a captain in the Mexican-American War, and held a number of prominent political positions, including a congressional seat. Thomas Francis Marshall also violated a slave he owned named Mary. Mary gave birth to a daughter, Laura, in 1832. Because she was Thomas’ daughter, Laura received special advantages, being taught to read and write and encouraged to develop her musical talents, which were exceptional. When Laura was 16, she was freed by Thomas’ wife. Due to her light complexion, most people thought Laura was Caucasian, and so she could roam the state freely without fear of being kidnapped and re-enslaved. Years later, Laura would travel with her daughter Julia, who was considerably darker and have her pose as her black servant so that they could stay at hotels together. In her hometown of Lexington, Kentucky, Laura Marshall fell in love with and married a free black man named Henry Harrison Britton, who made a living as a carpenter and barber. Henry and Laura Britton would have a total of 10 children, three of whom would become notable Kentuckians. Mary Ellen Britton was their third child, born on April 16, 1855, in Lexington. She entered life in a city that was the epicenter of the slave trade in Kentucky, host of the notorious “Cheapside Slave Auction Block,” where thousands of captive Africans were auctioned to places near and far by heartless white slavers. Less than a mile from Mary’s birthplace was the site where black infants were stripped from the arms of their black mothers, never to see each other again. Black husbands were divorced from their black wives, not because of irreconcilable differences, but evil plantation owners. Although the Brittons were free, there were posters advertising black humans for sale on building walls all around them, the base of the auctioneer’s voice and the cries of heartbroken black captives crowding the air on auction days. Freedom must have seemed to be an unsure thing for young Mary, something that could be snatched at any moment without warning. The Brittons prized education for their children, and more than anything else, this would shape Mary’s life. As a youngster, she read whatever she could get her hands on and attended the best primary schools available to black children at the time, which were located in Louisville, the state capital. Laura Britton routinely took her daughters Mary and Julia with her to assist in teaching local slaves to read and write. The two Britton girls got it impressed on them early on to help the less fortunate, to never forget that despite their advantages that their destinies were still intertwined with their black brothers and sisters who were slaves right down the road. The Civil War changed everything for African Americans, and the Brittons celebrated the freeing of the slaves with lovers of freedom around the world. About 1870, the family moved to Berea, Kentucky, a progressive community at the foothills of the Cumberland Mountains founded by abolitionist minister John G. Fee just 15 years earlier. Berea College was a Christian school that was “anti-rum, anti-caste prejudice, and anti-sectarian,” and encouraged blacks to enroll. Mary began her studies at Berea in 1871. While she was a student, her mother was the school matron (today’s dean of women), and her sister Julia was Berea College’s first black teacher. Tragically though, Laura and her husband Henry would die within a month of each other in 1874, and Mary would have to drop out and do something that would support her and her younger siblings. She never graduated from Berea College. Family tragedy would remain at Britton’s side throughout her life: two of her younger siblings died in the 1860s; her younger sister Hattie committed suicide by shooting herself in the head in the spring of 1891; drinking carbolic acid was the way her brother Thomas ended his life in 1901; her sister Lucy died at age 32 from nephritis; and Susan, her oldest sister, would die after a prolonged illness in 1914. Although there were several factors to the untimely death of members of the Britton family, the stresses and strains of living while black in the South undoubtedly contributed to their early mortality. There must be men of honor among you here this evening; who are ashamed that women bear equally with men the support of their families; in many instances working harder, better, and of longer duration, and yet receive smaller compensation for their labor, only because they are women. Christ gave the golden rule—“All things whatsoever ye would that men should do to you, do ye even so to them.” Would you like to be treated that way? Then you opposers of this needed reform [women’s voting], come down from your high perches of superiority and give to woman what is justly hers. Follow that golden rule. Woman has steadily risen in the growth of civilization, her sphere is enlarged and she has grown better by just that enlargement it was predicted would unsex her. She has not only learned the alphabet, but has also learned the verbs, conjugations, and declensions of all the languages, ancient and modern. She has taken the first prize in mathematics, science and philosophy. She has taken degrees in law, medicine and theology. She is employed in the mills and manufactories. She is a stenographer, type writer, cashier, clerk, telegraph and telephone operator. She is in the trades and professions, indeed she can go almost anywhere she chooses to go. She suffers all the wrong and impositions of the working man, and the addition of a still greater injustice, that a woman shall receive less wages than a man for the same amount and quality of work, simply because she is a woman. Woman of the nineteenth century is not keeping silence in the church, home or society. The great foreign missionary work is chiefly upheld by woman. She is the first to teach the gospel of the resurrection of Christ, to the heathen. She was the first to see our risen Savior. Like so many other civil rights activists, Britton understood that “injustice anywhere is a threat to justice everywhere,” and so she focused her considerable abilities on helping those whom America had left behind—blacks, women, children, the poor. As her star as an educator rose throughout the state, Britton used her enlarged platform to protest injustice. Just as a Seventh-day Adventist woman would refuse to give up her bus seat in 1944 and end segregated interstate busing in Virginia, so Britton would try to block a racist bill enforcing segregation in public transportation. In December 1891, when a powerful Kentucky senator attempted to get a vote passed in the Kentucky legislature that would racially segregate railroad cars, Britton helped organize a coalition opposing the bill. She delivered a masterful speech to legislators imploring them to reject the proposed bill on the basis of the guarantees of the Constitution, presenting proofs that blacks were not a danger to whites and appealing to their sense of fairness. The speech appeared on the front page of a local newspaper four days later. But despite Britton’s and her delegation’s best efforts, the Separate Coach Bill was passed by the Kentucky House and Senate and became law on May 31, 1892. While the Kentucky government was passing racist legislation, Britton remained busy improving the lives of the less fortunate in her home state. Just two weeks after her speech to the Kentucky legislators, she became a founding member of the Ladies Orphans’ Home Society (later the Colored Orphan Industrial Home), which provided life’s necessities free of charge to hundreds of orphans and elderly women. Britton was active in the Society until the last two years of her life. In the early 1890s, there were only a handful of black Adventist ministers, if even that. Aside from Charles Kinney, the earliest hired black minister by the denomination was Alonzo Barry. Described by a local newspaper as “about 57 years of age and nearly a pure African,” Barry, along with his wife—whose name we unfortunately do not know—were relentless in trying to win blacks in the South to the gospel message. In 1893, Barry and his wife convinced Mary Britton, previously an Episcopalian, to join the Seventh-day Adventist faith. Britton was one of 18 charter members of the black Adventist congregation in Lexington. Also one of the original 18 was the attorney James Alexander Chiles, who argued before the U.S. Supreme Court in favor of desegregating railroad coaches on the Chesapeake and Ohio Railroad after he himself was forcibly removed from a rail car despite holding a first class ticket. Britton and Chiles, like many blacks integral in equal rights movements, believed that the Adventist faith would only enhance their activism and efforts to uplift those marginalized by society. As an Adventist, Britton continued her activism, although now she took an active role in her local church, serving as the clerk, raising funds for mission projects, and even going out Ingathering. She is listed over the years in the financial reports of the Southern Union Worker (an Adventist periodical) as a reliable giver to mission projects. Britton attended the World’s Columbian Exposition in Chicago in the summer of 1893 and boldly tested to see if segregation existed at the fair by trying to enter the Kentucky building. She was refused entrance because of her skin color, one reporter writing of the “humiliation” and “indignation” that Britton experienced during the episode. This was supposedly the only racial incident reported at the Exposition. When people join the Adventist Church, they almost inevitably go to school or go back to school. In 1897, Britton moved north to obtain a medical degree from Battle Creek College and then American Medical Missionary College (AMMC) in Chicago. Like so many others before her, Britton became an ardent convert of Kellogg’s health philosophy and would champion the doctor’s principles for the rest of her life. One of Kellogg’s pupils, she especially admired his city missions programs in Chicago and, indeed, had a similar operations at her orphanage in Lexington. In 1902, Britton graduated from AMMC with an MD, in the same class with Harry Miller and Lottie Blake. The graduating class was entirely white, and one can only imagine what this was like psychologically for Britton and Blake. They were the first blacks to graduate with MDs from AMMC. That year Britton returned to Lexington, obtained a medical license—a singular feat in the male and white-dominated profession—and opened a practice in her home on 545 North Limestone Street. 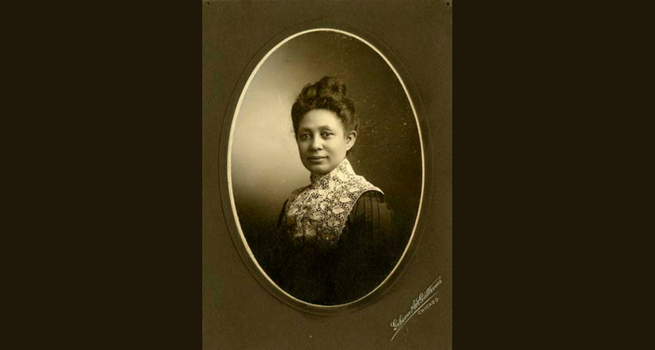 Thus, Mary Ellen Britton became the first licensed black female physician in Kentucky. True to Kellogg’s model, for the next 22 years she would provide medical care to the rich and poor alike, specializing in hydrotherapy, electrotherapy, and massage, and emphasizing the importance of exercise, good hygiene, and a vegetarian diet. Britton became a sought-after lecturer and writer on health now—no longer just woman’s and black rights and education—and was an outspoken opponent of alcohol and tobacco. In 1923, Mary Britton retired at the age of 68 after a lifetime filled with helping others. She would die almost two years later, age 70, on August 27, 1925, and is buried in Cove Haven Cemetery in her beloved Lexington. Mary Britton was a champion for the equal treatment of African Americans, women, children, and the poor, in a region and society that perpetrated the vilest atrocities on people of her race. She was up against entrenched systems in the very fabric of America that suppressed blacks and women. Britton’s family members were dying on her at every turn, and she probably faced a survivor’s guilt not unlike her early feelings of being free in a city that conducted one of the largest slave auctions in the nation. When she was in her late 30s, she embraced a faith that taught that the whole world would soon turn against those who believed as she did and try to exterminate them. Despite all of this, Mary Britton fought, with all her might, every day, by doing what she could, with faith in her God. She is not recorded as ever uttering one excuse, one complaint, or one word of capitulation to the forces that were arrayed against her. And she made a difference—a big one. Evil men and the system they create can never defeat, and have never defeated, people like Mary Britton. These newspapers provided contemporary accounts of Mary Britton’s life: Lexington Leader, Courier-Journal, and The Lexington Standard. For the Paul Laurence Dunbar poem in its entirety, visit Wright State University’s Special Collections and Archives (https://www.libraries.wright.edu/special/dunbar/poetry/348). Lauretta Flynn Byars, “Mary Elizabeth Britton,” in Jesse Carney Smith, ed., Notable Black American Women, Book 2 (Gale, 1996), 55-57. R. Steven Norman, IIII, “Fighting for Justice,” Southern Tidings (February 2006), 4-6. Karen Cotton McDaniel, “Mary Ellen Britton: A Potent Agent for Public Reform,” The Griot: The Journal of African American Studies 32, no. 1 (Spring 2013), 52-61. Richard D. Sears, “Mary Ellen Britton,” in Gerald L. Smith, Karen Cotton McDaniel, and John A. Hardin, eds., The Kentucky African American Encyclopedia (The University Press of Kentucky, 2015), 64-65. Images courtesy of Berea College.